A Gospel driven Family: A review of "Building a Healthy Multi-Ethnic Church"
A review of "Building a Healthy Multi-Ethnic Church"
Christian America is eleven o'clock on Sunday morning." Regardless of how much you agree with other theological positions of Dr. King, one could hardly disagree with this quote. While not intentional, as I would presume all Christians would affirm, most of the churches I have served in have been almost entirely comprised on not just one particular ethnicity but usually on particular economic class. In fact, I remember a Pastor telling me that it was impossible to reach out to every people group both ethnically and economically. He instead insisted on focusing on one or possibly two for the sake of church growth. But this just never sat well with me and left me squirming more than a 5 year old during Sunday worship after a breakfast of sugar-laiden Pop Tarts (Parents, you know what I'm talking about). Recently I began looking for resources that might help to answer the challenge Dr. King brought to light in the quote mentioned. After a brief search on Amazon, not the best resource for theological solidarity, I found a few books on the topic of multi-ethnic ministry. I chose two that seemed on the surface to be just what I was looking for. "Building a Healthy Multi-Ethnic Church" by Mark Deymaz was the first book and the follow-up "Leading a Healthy Multi-Ethnic Church" was written as a companion to build off the principles of the first. After reading the first book though, I am unsure whether it would be worth my time to read its younger sibling. I take note of people who endorse or otherwise recommend books, articles, or other literary items. While not definitely assured that their endorsement will ensure a theologically sound treatise, one usually can count on their recommendations as a green light for biblical alignment. On the first page of this book six endorsements can be found...five of which were completely new to me. But I am aware that some endorsements may come from little known brothers and sisters in Christ. My endorsements of books such as "The Playbook" is clearly a practical example of this since nobody (and I mean nobody) reads my endorsements and thinks "Hey, Adam Gray reviewed and endorsed this book. That settles it for me!" As I stated, I don't know five of the six men who praised Deymaz's book but the sixth one sounded familiar. Does the name Doug Pagitt ring a bell? If you were privy to the emergent movement then it definitely should. I will not dedicate much more to this point except to say that if he endorses a book then your discernment meter should be turned up extra high. With this in mind I read through the book anyway, realizing that even someone like Pagitt could endorse a good book once in a while (insert blind squirrel and nut analogy here). Don't be seeker sensitive but be sensitive to seekers? I am no fan of the seeker-sensitive movement. Having read some of these books for college classes (as critiques) that promote such approaches I have had my fill of the notion that the local church is "me-centered" or even "they-centered" rather than Christ-centered. The author seems to take a stand against identifiers such as "seeker-sensitive" (11) but actually uses the term (115) and its teachings throughout the book as ways to reach the local community. Rather than the local church being a place for the redeemed he believes we are to "demonstrate that the church is not about us but is about others" (98). If a church is built on the construct of attracting non-Christians it is built on a foundation of pragmatism which, as all sand does, shifts with time. The book is divided into three sections. At the end of each chapter in the first two sections are testimonies of some associated with Pastor Deymaz's church, Mosaic Church in Little Rock, AR. Six of these are meant to be salvation testimonies while the other five detail how Mosaic impacted lives for the better. 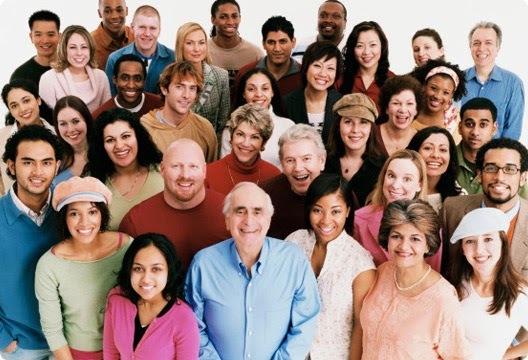 Highlighted in each are the benefits of ethnic diversity within a local church. Missing from every single one of the supposed salvations testimonies were three things: 1) Recognition of one's sin against God, 2) Conviction of sin, 3) Repentance and directed faith in Christ's finished work on the cross. While the fourth testimony had a hint of at least the cross, each of them lacked in what the Bible describes as true repentance of sin. In fact, none of them mentioned sin at all. The closest was the sixth testimony of an addict but it centered on his addiction without defining it as sin against God. Could the people who gave these testimonies actually be Christians? It is definitely possible. Sometimes we have a hard time articulating such a dramatic event as our conversion but as a Pastor I would be hesitant on including them in a book. Reading from Scripture or into it? Often, a particular viewpoint can cause us to incorrectly read into a passage something that it was never intended to convey. The author does this on several occasions seemingly in an attempt to justify his position for multi-ethnic churches. However, this was unnecessary since he already had ample biblical evidence to do so. Revelation 2:4 is a well known verse where Christ admonishes the church in Ephesus for forsaking their "first love". The context of the passage and the primacy of where the affections of the Christian should reside has required that the first love identified in that passage is the love we are to have for God (Mark 12:29-31). However, Deymaz insists that the first love is not one of "priority but one of prior love". To prove this point he directs the reader to Ephesians 1:15 where Paul commends the believers for their "love for the saints". He therefore proposes that the love they later lost was love for other believers. One would need to perform a series of interpretive leaps to reach such a conclusion and only if one ignored the remainder of Scripture. If Christ were speaking of prior love than the priority of love then it would be the only passage where such an interpretation could be obtained. With the exegetical interpretation and historical commentaries against such a position I could only assume that such a position was reached due to inference and presupposition. Deymaz also takes a stab at Christ's encounter with the rich young ruler detailed in each of the synoptic Gospels. His understanding is that the rich young ruler simply could not see past his physical life, therefore believing Jesus' insistence to give away all he had was foolish. But he doesn't mention the ruler's insistence on his ability to keep all the commandments which evidently identified his issue as one of pride and a refusal to acknowledge his violation of God's law. This is why Jesus' identification of the riches of this man was a light shining on his idolatry and therefore his inability to keep the Law. Deymaz's interpretation of this passage occurs in the chapter titled "Embrace Dependance" where he rightly reminds believers to rely on one another and God's provisions. But the use of this passage to remind the believer of this takes it out of its context rather than using clearer passages that teach such (Acts 2:44; Galatians 6:2). Deymaz rightly calls us to examine whether our churches are reflective of the community in which it resides or has become complacent in reaching out only to those they are most comfortable with. This type of unintentional bias in ministry is wrought with all sorts of problems. But few, if any, would admit to doing this. Why? Because we are usually unaware of the comfort bubble we have created for ourselves. We didn't intend to create it but it is nonetheless there. "...we should not expect to integrate our leadership teams through random prayer or wishful thinking. Diverse individuals of godly character, theological agreement, and shared vision do not just arrive on waves of whim. Rather, they must be intentionally sought." "...while quotas should in no way dictate the diversity of your staff, potential hires must be considered in light of both the current and future composition of your team." "...saying yes to someone of a particular ethnicity or other valued descriptive (one who is Deaf or Blind, for example), you may have to say no to someone else like him or her later on, in order to maintain the general balance of the team." The last section I quoted could be practically summarized like this: "If you have a leadership team comprised of one White man, one Asian man, and one Black man and you have a pool of candidates that are all equally qualified, you should choose one of the ethnicity or 'valued description' that is not already represented." I searched and searched and didn't find that particular qualification regarding either Elders or Deacons. How would those conversations with the candidates that were nominated proceed? "Sorry Will, but we already have a white guy on the team. Sorry Terry, but we already have your ethnicity represented. Marcus, we could use you on another ministry where your people group has an opening." As always, much more could be said but I believe my attempt to highlight the major concerns will provide a starting point for determining the biblical validity of this book. While there were certainly some solid points, most were overshadowed by the shakier ones. Scripture clearly teaches the integrated nature of the local body of believers (Galatians 3:27-29). It is a place where culturally constructed boundaries are broken down and unity in Christ crosses borders, biases, and stereotypes. Only two "races" exist: those who are under Adam and those who are in Christ (Romans 5:12; 1 Corinthians 15:22). What is the solution to the problem Dr. King proposed? It might be simpler than we realize. You see, we surround ourselves not just with other Christians but other Christians with whom we are often most comfortable. In a social media-driven world that allows you to "block, unfriend, unfollow, and hide" those you don't agree with, we fail to realize that this is just a more convenient extension of how we live our lives as believers in the real world. We associate with those of whom we have the most in common and keep at arm's length those with whom we have less in common. We of course seek out doctrinally sound churches that have specific leanings in line with our own but take a look around next Sunday. Maybe we do hold to similar doctrines but does that mean we must all come from the same economic, social, or cultural group? If our local churches do not reflect the community in which they reside, is it possible that we are missing something? Could it also be that we just assume, as the book does point out, that some would not be as comfortable in our church as they might elsewhere? If we do so it is because we presume (one might even say "stereotype") others based on their ethnicity, social status, or economic placement. But this mentality is not limited to one people group. As I have seen, it is evident across the spectrum of people groups and denominations. Care must be taken at this point to not swing to far to one side that the other. Social, economic, and ethnic differences can suddenly become primary factors in who we reach and elect to positions. While I know the author would say this was not intended, I could not help but believe that some parts said otherwise. We must be cautious to not limit who we reach out to just as much as why we are reaching them. If our primary intent is to diversify the church then we will still end up forsaking some people groups for others. The only difference though will be that we will ignore people groups already represented in our churches for the sake of reaching those who are not. Rather, if our desire to disciple others to Christ through the preaching of the Gospel is driven by our love for God and love for our neighbors, despite their socio-economic or culturally defining factors, then we will be led not by external appearance to love them but by the same grace that has saved us. We must be sensitive to cultural differences and foster a measure of understanding to bridge cultural gaps, but that is part of the nature of the country in which we live. We are a compilation of differing traditions, backgrounds, cultures, economic standings, etc. So too, our churches should be reflective of the same but not by forced diversification. If we are obedient to the commands of Scripture to reach the lost and lay aside assumptions I believe God will add to His Kingdom through the local church as He designs not as we plan. In terms of biblical validity, I believe that "Building a Healthy Multi-Ethnic Church" was left lacking support from Scripture. While it sets itself up to answer many questions regarding this issue I was left with nothing more than another pragmatic positioning supported by testimonies that are far too common in modern evangelicalism and often prove to be evidence of seed that never fell on good soil (Luke 8:8).